After a hectic weekend, the time finally arrived this morning to cut the ribbon and declare the Deli officially “Open”. 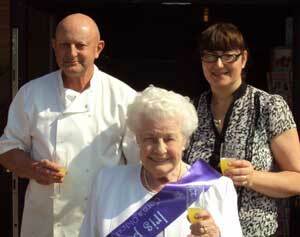 We asked Iris Parrish, 92, to do us the honour of cutting the ribbon. Iris is the oldest resident of CORA (the Circle Of Residents Association) which serves the people of Higher Prospect Village. Iris has two grown up children, 5 grand-children and 7 great-grand-children – some of whom were there this morning to see Iris perform the most important of duties for us! It’s thirsty work opening a Deli! “I was pleased to be asked” said Iris, “I’ve lived here for that many years now, you get to know everyone and I’d hate to live anywhere else”. Iris remembers The Rag, recalling it as being “much smaller, just a counter serving beer, nothing like it is today”. We are selling our own range of homemade pies, sausages and cooked deli meats as well as a range of fresh bread, muffins, cookies, fruit and vegetables and basic grocery provisions. Benny will also be introducing a fresh fish (to order) service over the coming weeks. The deli will be open Monday – Saturday 8am – 6pm, and 10 am – 4pm on Sundays and Bank Holidays. We are so excited here at The Rag ….. the brand new Deli is almost ready, and is being officially opened on Monday 8th July by Rawnsley’s oldest resident, Iris Parish. Ms Parish, 92, has memories of delivering the post to the Rag back when it was known locally as The Raglan House and is a popular figure with locals, thanks to her daily walks around the village – many of you will have seen her on her travels, so it seemed fitting to ask her to do the honours and perform our official opening for us. The deli will stock our own brand of home-made pies, sausages, deli meats, fresh fish (to order) and home-made chutneys as well as basic groceries and provisions.